A New and Accurate Map of Europe. 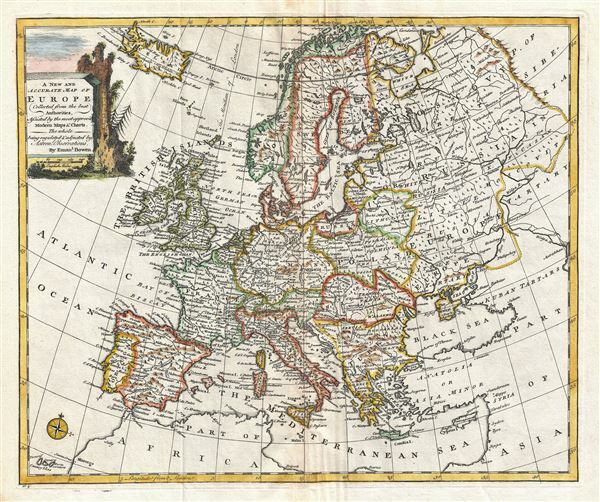 This is a beautiful 1747 decorative map of Europe by the English cartographer Emmanuel Bowen. The map covers from Iceland to Tartary and south as far as North Africa. It also includes western Russia and the Black Sea. It renders the entire region in extraordinary detail offering both topographical and political information with forests and mountains beautifully rendered in profile. Territories and kingdoms are noted with outline color. A beautifully engraved title cartouche adorns the top left quadrant. This map was prepared by Emanuel Bowen as plate no. 5 for the 1747 issue of A Complete System of Geography.